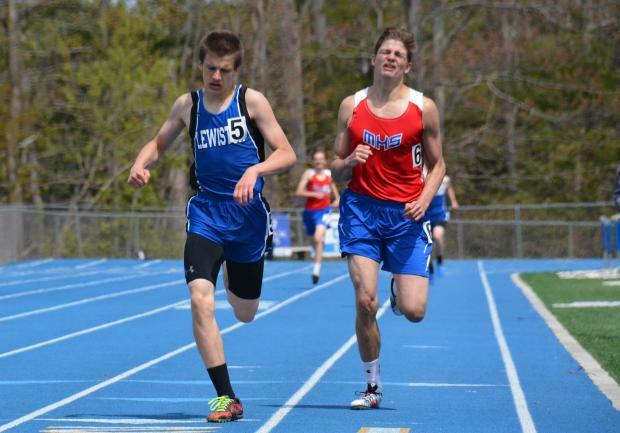 Lewiston swept a six team meet at Morse collecting a huge 266 points in the men's meet and 186 in the women's meet. 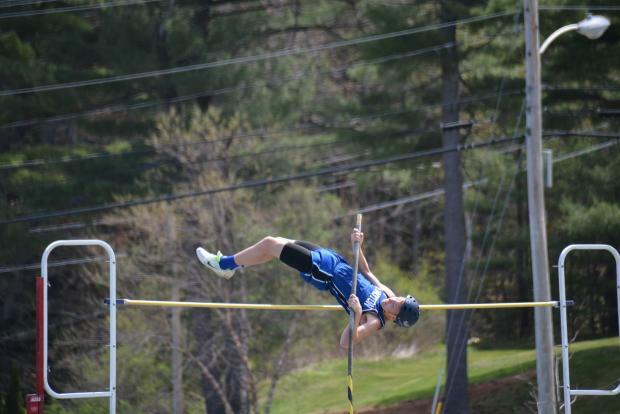 Following the Blue Devils in the men's meet were Lincoln Academy (109.50), Morse (88), Messalonskee (48), Medomak Valley (34.50), and Oceanside (29). There was tight competition for the second spot in the women's meet as Messalonskee claimed the runner up position with 125 points to just edge Lincoln Academy by one; Medomak (63), Morse (47), and Oceanside (29) followed. By noon time most of the spectators had left and several of the buses had already pulled away but Lewiston's Nick Roy, who would prevail with a vault of 11-0, was still battling for fist position with Morse's Ben Brewer, and Josh Goff of Messalonskee. Roy's jump was new personal best; he also took first in the race walk and placed in the triple jump. Brewer would end second for the Shipbuilders while Messalonskee's Goff finished third. 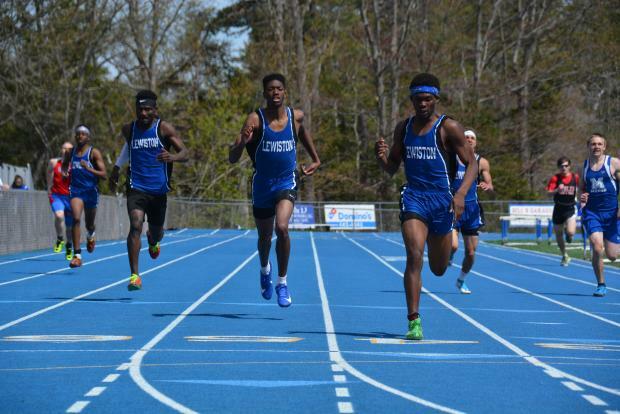 The Blue Devils got an additional eight individual wins, and also took the tops spots in the 4 x 1 and 4 x 4, but as usual it was their depth that accounted for the immense point total. The meet was scored to six places in the individual events. The Blue Devils were able to take four of six spots in the javelin, triple jump, 100, and 200, and took all but one scoring position in the 400. Connor Kaplinger won the javelin with a throw of 155-02, and took second in the discus. Kamundala Crispin earned top honors in the triple jump bounding 41-09.5, and took the second spot in the long jump. Crispin may have been most pleased with his third place finish in the 400 (54.24) as it was a new personal best. Jeremiah Williams claimed two wins with a high jump of 5-06, and a 200 run of 24.36; he also took third in the 400. 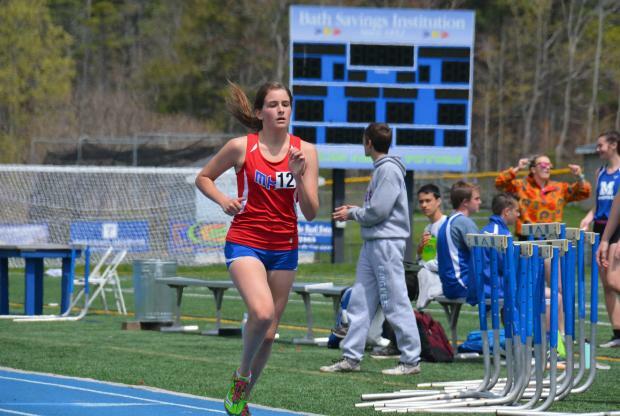 Leading the horde of Blue Devils across the line in the 400 was Noor Shidad at 52.84. Shidad also took second in the 200. Maurice Beaulieu won the 800 by a razor thin margin as he chased Messalonskee's Steven Lujan down the back stretch and caught him within 20 meters of the finish. Lujan had led from the gun. Expect a better showing from the Messalonksee Eagles when these teams all meet again at the KVAC Championships at Mt. Ararat on May 26th. The weather has wreaked havoc on schedules throughout Maine this spring but the Eagles may have felt the impact more than any other squad. To catch up they've engaged in some unconventional scheduling. They were ready to go Saturday morning at 9:00 AM at Morse which is remarkable since they'd been at a meet at Maranacook Friday evening. Plainly this led to some choices being made at both meets that muted the Eagles ability to run on all cylinders. Lincoln Academy nailed down the second spot with a couple of wins by Sam Russ in the 1600 (4:43.9) and the 3200 (10:24.62); Russ had teammate Jarrett Gulden right behind him in both races. The Eagle got another strong performance from Lauren Pusey-Nazzaro who won the long jump with a leap of 19-04.5 just edging Lewiston's Kamundala Crispin. Pusey-Nazzaro conceded the top spot in the triple to Crispin but his jump of 41-07 was just 2.5 inches short of a second win. Both marks were new bests. As smoke from a controlled burn generated by a training exercise for local fire departments across town briefly enveloped McCann Field Tommy Thelander stretched to victory in the 300 meter hurdles (43.30) to give the Eagles their fourth win on the afternoon. Medomak's Elijah Lash placed in the 300 MH and took the top spot in the 110MH to give the Panthers their lone win on the day. Oceanside had opened the meet with a win in the 4 x 8 and got a strong performance from Chris Carroll who won the discus (130-06), took second in the shot put, and placed in the javelin. The host Shipbuilders got a win from Austin Baltazar in the 100 at 12 flat, to go with his third place finish in the 110 hurdles. William Carrolton took the shot put at 41-03 and placed in the discus. Ben Brewer had been in the hunt for the pole vault title but ended second and complimented that by placing in both the 400 and as part of the 4 x 400. 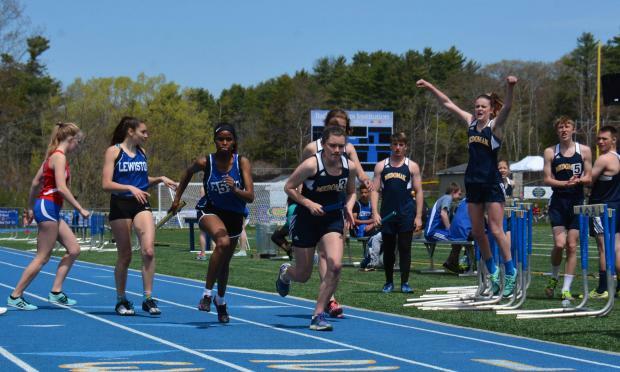 The Lewiston women got team wins in the 4 x 1 and 4 x 4 but-with the exception of stalwart Zaid Teklu in the 1600-got most of their individual wins in the field rather than on the track. Taylor Chamberlain took the high jump at 4-10 and added a pair of second place finishes in the 100 and 200. Laila Bunnitt flung the discus 97-02 for the win to go with her second place finish in the shot put where she conceded the win to teammate Benedict Citenga (30-04). Brooke Cloutier made it a sweep of the throws for the Blue Devils by throwing the javelin 87-06 and Sydney Roy again placed in all three throwing events. Teklu's winning time in the 1600 was 5:46.07 and she had solid support form Juliet Bolduc who took second after a back-and-forth race with Lincoln Academy's Ella Villeneuve for the runner-up position. Runners-up Messalonskee squeezed out its one point edge over Lincoln Academy late in the meet by claiming three of the scoring positions in the 3200 led by Sarah Kohl (12:23.53) and Peyton Arbour in a one-two finish. 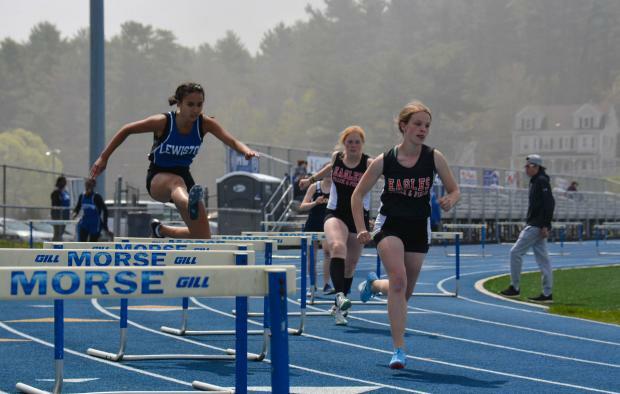 The Eagles of Messalonskee also got first place finishes from Markiana Hewett in the 100 meter hurdles (17.73), and Maria Veilleux in the long jump (14-04). Libby Breznyak won the pole vault (8-06), and was second in both the long jump and triple jump. Lincoln Academy ruled the sprints and middle distances as they took firsts in the 100, 200, 400, and 800, and topped it off with a win the 300 meter hurdles. 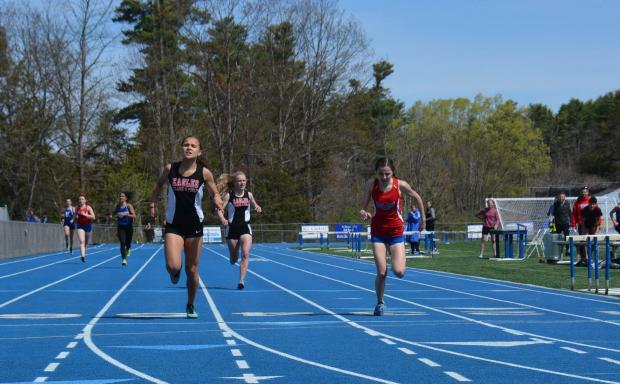 Senior Katherine Hoving was first in the 100 at 13:39, while first year Elizabeth Hoving was third. Elizabeth also took the 300 MH (52:03) and was third in the 100 MH. Katherine also collected a third in the 400 which was won by Teammate Tahlia Mullen (61.02) who bookended that win with another win in the 200 (27:72). Maddy Archer nabbed the top spot in the 800 at 2:35.53. Medomak Valley won the 4 x 800 to open the race and had an individual win in the race-walk where Jayla Robinson's 9:29.56 took top honors, but the Panthers ended the day with a gritty finish in the 4 x 400 as they finished second to Lewiston by just 0.01 seconds. The entire race close but the anchor leg was shoulder-to-shoulder from the final pass of the baton to the finish line. Emma Gould claimed the top spot in the triple jump by bounding 31-02.50. For Oceanside Anna Poisson had a strong meet placing in all three throws.